1.) The Stylish Wanderer. She's the same age as me, and her style is so sophisticated! I really enjoyed designing the skirt and mesh corset, the colour worked really well. And I have something of a penchant for floppy hats. 2.) Cheap Thrills (Raez)- She comments on my blog a lot, and I'm a great admirer of hers! She makes you want to live life full of bright colour, and her photography is so inspirational. 3.) Pink Champagne (Adela)- Whenever she posts, Adela reminds me of some Titania like person. So I took some inspiration from that too (plus the ophelia portrait). 4.) Fashion Toast (Rumi)- Simple chic pieces and quirky vintage finds was what inspired me here. I wanted the details to stand out, such as the lace on the dress and the blue lining inside the boots. 5.) Sea Of Shoes (Jane) Well, of course the shoes were the main focus here! I love the Ruff Cuff shoes, just because I think I want a pair myself! And the fold over boots followed on from a whole themeof draping, wrapping and generally manipulating fabric. 6.) Fashion Pirates (Arabella)- I took her blog name slightly literally for the second outfit! But only the most fashionable of pirates would dress like her. The first was inspired by her "turn anything into an item of clothing" style. In this case, a lampshade! 7.) Lips of London (Nicky)-Only English blogger I chose actually! There aren't enough of us.. 8.) Pandora. I guess I was inspired by that whole 60's feel.. And the pink coat is based on some fabric I actually own, so that one could maybe be turned into a real garment! may find me sowing felt circles on to them soon! 10.) Karla's Closet. Really liked her editorial style, and the skirt was actually inspired by the the pattern on some ornamental grass in our garden. As many of you will know, I'm an avid young amatuer designer and when I'm not wielding a camera or wading in streams posing, I'm usually to be found with a sketchbook in hand scribbling ideas. My latest inspiration has been looking at my favourite fashion bloggers. I know that the 'blogger portrait' idea has been happening for quite a while now but I haven't (as yet) come across any instances of people designing specific outfits for individual bloggers. So this is what I've done! I have selected 10 very different bloggers, all of whom I admire and find inspiring. But it was so hard to choose! I admire so many more, but if I'd done all the ones I wanted to do, I think I wouldn't leave my room for several months! So I decided to plunge in and make a start somewhere... But this may only be the first phase. For each blogger I came up with a concept of two outfits based on my interpretation of their personal style. All sketches copyrighted to me. Dress + River = A bit of a theme at the moment. I swear this is the last of the season, but who could resist jumping about and stone skimming in a frock? I love the surreal-ness of wearing a vintage silk ball gown in a (thankfully) secluded Welsh stream. This particular pale teal beauty was bought by my mother from a car boot sale (like a yard sale) in the late nineties. So it might not technically be vintage,but its definitely retro! Sadly, no ball has been forthcoming, but I thought it deserved it's own little weekend outing anyway! The thing I particularly love about silk is the way it immediately changes colour in the water. And although I wanted to do a proper 'swimming in the river shot', my cold prevented this. 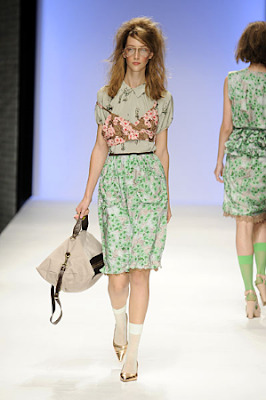 So as you can probably tell from my last post, I've been following London fashion week rather wistfully. I really wish I could be there! But I suppose I couldn't really getto any of the shows.But it does all look so amazing. I've also been enjoying the regular street style updates on Jill's blog. Another great side of fashion to see! Oh,and remember that the Q&A post should be coming very soon. So carry on asking! I'm off now to upload about a million photos from a little photography project I did today. Hello everyone. Hope you've all had a good week. 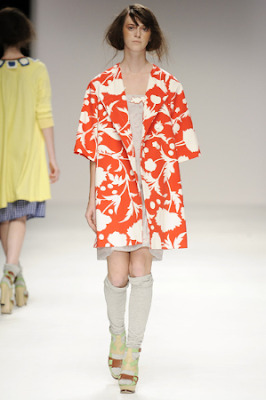 Beginning of London fashion week today, will someone tell me why I can't go! Disappointed doesn't even begin to describe it. Maybe next year though. My dream is to one day get to meet Vivienne westwood or Stella McCartney. But I thought I'd post some photos to cheer me up. So I don't need another long story about the shoot, because that part has already been explained! This gold cardigan was found in a charity shop, still with the original label! I love the fact that it's this really grown up refined cardigan, but so sparkly and gold too. I made the skirt in spring, but it took me until the summer to hem it! It's actually made out of some old curtain material that was my great-grannys. I think the colour is just beautiful. The lace top underneath is from h&m, and the brown leather belt is a vintage one that my mum got from a charity/thrift shop when she was a student. The white shoes were another charity shop buy (I like to pretend I'm Twiggy, or Jean Shrimpton when I'm wearing them because they have such a nostalgic sixties feel.) The gold watch was my grandmothers, it has stopped but I still wear it as a bracelet. Kind of awkward if people ask you the time though! And the amazingly crazy leopard print gloves were a gift from my paternal grandma. Thanks Babi! I'm off now to take pictures the rugged welsh countryside and do lots of drawing. My idea of a perfect weekend! Interesting experimentation with the image editing software on my computer. Not sure if I look a little too much like a cardboard cut-out? These photos were taken late afternoon last Friday. Another advantage of living in the middle of rural nowhere is all the rivers and streams nearby.. .(rivers and streams= near. Proximity to motorways and civilisation=far!) And we were so desperate to catch those last few rays of sun before it all dissolves into autumn. Recently, I've been looking at the portrait of 'Ophelia' by Millais. (And I do mean literally looking at it, I have the postcard tacked up on a shelf next to my bed!) I was thinking how interesting it would be to do a kind of watery shoot, especially with a floaty dress. This particular chiffon number was purchased in Edinburgh in a vintage shop called Godiva, in Grassmarket. I was so surprised at the sale price (£10) that I had to get it. I think it's the really lurid orange 70's colour that did it! Now,I do have to admit, I did suffer for my art! The water wasn't exactly bath temperature (freezing might describe it a little better- see the picture of me grimacing in between shots.) But the end images really made up for all that. I do feel that they're very ophelia-like. The converses were from a charity shop, the scarf from my dressing up box (yes, I do still have one! I personally think everyone should..) and the necklaces are all vintage ones from different sources. Oh,and also a huge thankyou to Jazz of http://jazzlovesyoumore.blogspot.com/ for doing this wonderful portrait of me! I was so flattered when she told me. I love the way she captured the detail here.So huge thanks again.